PCW ring announcer Joanna Rose was in charge of ring announcing, commentators Mark Adams & Matt Taylor have shared the ring announcing duties since Jenna Ellison left the company 18 months ago and while they both do a good job it's something I've never liked so hope this is a permanent thing, other than calling the belt the FS title (a big no no in the company, it's the Futureshock Title, the owners get very funny if you refer to the company as FSW) Joanna did a great job. As far as I could tell there was no commentary recorded, I will be VERY interested when I get the year-end box set to see how the commentary sounds because from my own personal experience it just doesn't sound as good if you aren't there live. 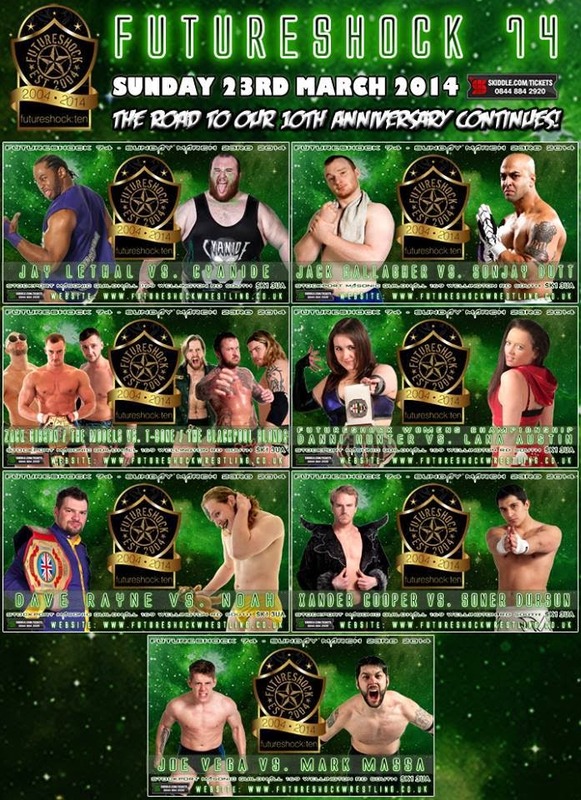 As a head up to anyone from the company I would happily and willingly come out of retirement to call a Futureshock show! Having settled into my front row seat and with the place full to bursting we got underway with Joe Vega defeating Mark Massa in a good, short and fast paced match, I think this one went less than 10 minutes but actually felt a bit longer, Massa hit a great looking spinebuster while Vega got a really nice moonsault press and finished the match with a springboard tornado DDT. Zach Gibson & The Models d T Bone & The Blackpool Blondes in a fun, entertaining match. Gibson successfully retained his Futureshock Championship in a very good match last time out so this was a nice little continuation of that storyline. The Models are crazy over in Stockport, A young girl in the front row was giddy with excitement when the men came out and I honestly thought she was going to cry when Hotstuff Hayes slapped her hand! At one point we had a very entertaining moment as The Blondes put Bone in a corner, then put Axel Rage into a tree of woe so he was draped across Bone, they then suplexed James Drake onto the pair of them, certainly an interesting move. I must say I'm still waiting for the moment that Melanie Price turns on her charges, maybe it's just me but I don't like babyface teams with managers and Ms Price is way way more effective in the heel role. The Models hit The Snapshot (3D) then Futureshock champion Gibson hit his Liver Driver (modified brainbuster) for the win. In the main event of the first half we got an absolute master class of a match between Jack Gallagher and former TNA star Sonjay Dutt. My friends and I were expecting a technical masterpiece between the two and were sometimes that can create a quiet crowd especially with casual fans. We got what we wanted and should not have worried about the crowd one bit. The match was fast and fluid, with both men doing little touches to keep the fans entertained between sequences. For example Sonjay kissing Jack's hand, Jack smiled and without missing a beat wiped the hand on the referee's shirt. Dutt locked an Octopus Stretch, a favourite submission move of mine then Gallagher, later on he went for his moonsault double stomp but Gallagher moved out of the way, connected with a picture perfect dropkick to the jaw and finally hit a Swanton bomb for the win to a standing ovation! After the intermission the ridiculously over (and one half of the tag team champions) Dave Rayne defeated Noah in a match that not only featured the expected shenanigans but also some really nice wrestling. Noah brings a small, burned teddy bear to the ring with him so before the bell Rayne got on the mic and introduced his tag team partner The Nordic warrior who was holding Little Rayne - a large teddy bear which got a rousing LITTLE RAYNE chant. Highlights of this one were Warrior running in terror from Noah's fearsome scream, Noah hitting a beautiful armbreaker and Rayne winning with his back cracker off the top rope. I'd like to see the 2 of them go at it again in the future. Next up was the only title match of the evening as Woman's Champion Danni Hunter took on impressive newcomer Lana Austin after Lana had pinned the champion in a mixed tag match at the last show. Both girls looked good in the ring, Danni hitting a really nice spinebuster and letting out a war scream that sent chills down your spine, definitely one not to be crossed. Unfortunately this one was just hotting up when Danni's Uprising companions hit the ring. Lana didn't give a damn about them though and hit Don Meacho with a really nice cross body to the outside, then, as he staggered into the ring she hit her Kiss Of Death (tilt a whirl stunner, a move that has to be seen to be believed) but this left her wide open to a spin kick from the champion for the win. I would have liked at least 5 more minutes as this one felt way too short but I'm sure the storyline is leading to these 2 facing each other again one day! After the bell it looked like The Uprising were going to attack Lana some more but Si Valour and Sparx made the save. Sparx complete with new ring gear made me a happy chappy. They brawled with The Uprising until Valour got on the mic and challenged Meacho and Ryan Hendrix to an impromptu match there and then, which the heels accepted. Sparx had a great big bandage on his left shoulder which any wrestling fan will tell you is just a big target for a man as nasty as Meacho, he picked Sparx up and dropped him shoulder first onto the ring apron! The heels got the win after Sparx stopped Meacho using Xander Cooper's Tournament trophy, then used it himself causing a DQ. Valour did not look happy about this at all and argued with Sparx who tried to protest his innocence all the way to the back. While the famous Stockport raffle was being drawn Joanna announced that PWG star Drake Younger will make one of his last Indy appearances before joining WWE at the next Futureshock Underground show on April the 19th. I've been an admirer of Younger's for a while so this pleased me. Speaking of pleasing me the main event certainly did that as Cyanide defeated Jay Lethal in a superb match. The action started hot and heavy as Lethal delivered a superkick the moment the bell rang, this staggered the big man who bailed to the outside, Lethal then hit a suicide dive to Cyanide's manager Chris Egan while the fans roared their approval. Lethal followed this quickly with an attempted cross body but was caught ant dropped into the apron by "The Toxic Terror". Lethal unloaded with punches which just made the big man mad to the point where he unleashed big Vader style haymakers in the corner then caught Lethal attempting a cross body and turned it into a wicked power bomb! Lethal managed to rally, hitting a missile dropkick and a lovely standing moonsault for 2 but when he charged at Cyanide in a corner he was met with a massive dropkick from Cyanide. The fans were at fever pitch by now, chanting this is awesome as Cyanide hit his Cyropracters Dream backbreaker for 2. The match went back and forth and the fans were screaming themselves hoarse as Lethal connected with a hurricanrana, a superkick and his Randy Savage style elbow drop, we thought that was enough but Cyanide still managed to kick out. Lethal called for his Lethal Injection move but as he attempted it Cyanide hit a lariat that turned Lethal inside out, amazingly the resulting cover got a 2 count. With Lethal down Chris Egan brought a ladder into the ring, when referee Darren Bateman tried to stop Cyanide using it he got in the refs face in a corner, Lethal loaded up for a superkick but Cyanide moved and the kick hit the referee square in the jaw, to the utter joy of the crowd. Lethal Injection put Cyanide down but there was now no ref, a second ref came out but only counted 2 as Cyanide kicked out! Egan got up on the apron, Lethal dispatched him with a punch but this left him wide open to a gas Chamber power bomb from Cyanide to get the 3! After the bell Cyanide put the ladder on top of Lethal's broken carcass and threatened to moonsault onto it, but Zach Gibson came out to make the save. Egan got on the mic and demanded a title shot for his charge who not only accepted it but said it will be a ladder match at the next show!!!!! All in all this was the best Futureshock show in some time, every single match delivered, the crowd were super hot and at no point were they quiet. Both imports were on top form and hopefully will attract some of the casual fans who came to see them will have enjoyed the British guys and will come along again. A superb night!